Ras el hanout is a fantastic North African spice blend, complex, warm and fragrant, without too much heat. 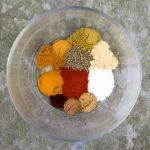 It takes just a few minutes to combine these eleven spices, most of which you probably have in house, and there are so many good reasons to have a jar of Ras el hanout on hand. It’s a delicious rub for beef, chicken or fish and a wonderful flavor base for soups, stews and marinades. “Ras el hanout” is Arabic for “head of the shop,” which refers to the fact that this mix of spices is top of the line, the best mix of spices in the shop. And I have to say, it’s become the head of my spice cabinet. I’ve been fairly obsessed with it lately – rubbing it on lamb before grilling; mixing it into yogurt for marinating chicken; smearing it on eggplant before roasting. So far, everything I’ve made with ras el hanout has been totally delicious. 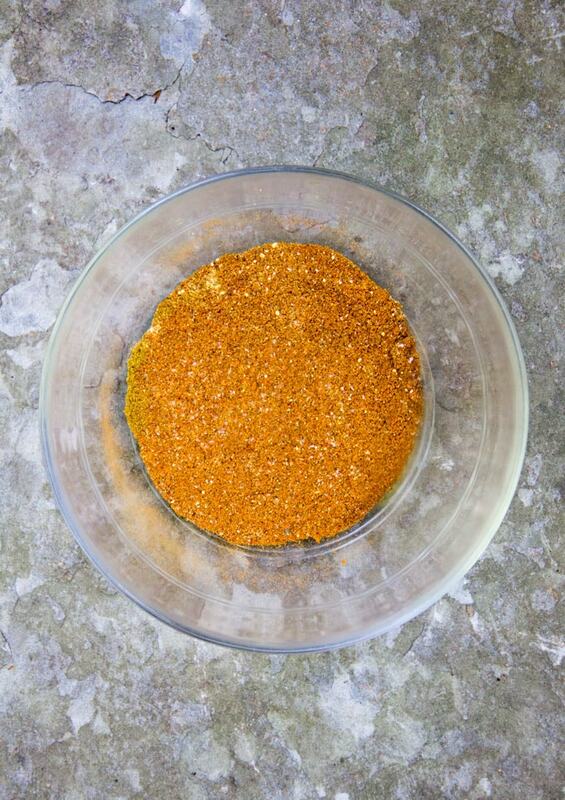 There is no definitive recipe for ras el hanout. Some mixes contain dozens of spices. Others have only a handful. Certain spices are common to all mixes, such as cinnamon, cumin and ground ginger. I tested various combos of spices and I’ve come up a spice mix that I absolutely love. If you want a delicious recipe for your spice mix, try this Ras El Hanout Grilled Chicken Thighs Recipe. It’s a simple marinade of yogurt, garlic, lemon and ras el hanout spice mix. The chicken comes out tender and scrumptious! Also, Ras El Hanout is the perfect mix of spices for flavoring Moroccan Tagines. Try it in this slow cooker chicken tagine recipe. Use 4½ teaspoons of ras el hanout plus ¼ teaspoon crushed red pepper flakes, in place of all the ground spices listed in the tagine recipe, and use only one cinnamon stick instead of two. 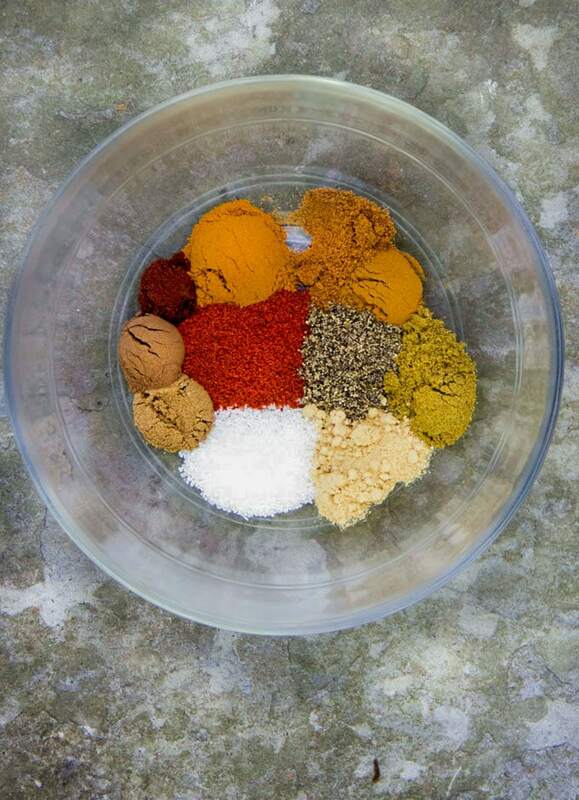 Here’s the recipe for ras el hanout spice mix. If you make this I hope you’ll come back to leave a review and let me know what you think. A fragrant spice blend for rubbing on beef, chicken, fish or vegetables and for seasoning soups, stews, and marinades. Mix all the spices together. Store in an airtight container in your spice cabinet. NOTE: For an even more spectacular flavor, toast and grind cumin seeds and coriander seeds before adding them to the mix and use freshly grated nutmeg. NOTE: If you’re on a low-salt diet or if you prefer to salt your dish, to taste, you can omit the salt from this mix. I just came upon this recipe a few weeks ago when another recipe I was using called for a spice rub. Wow – what a great combination of flavors! Thanks for posting – it was the star of the chicken dish I made. So glad you’ve discovered Ras El Hanout, Lisa. It’s been my go-to spice mix for years. My mix contains 15 ingredients. Original Moroccan versions use as many as 50. British colonialists were fascinated with Ras el Hanout, because many of the ingredients were said to be aphrodisiacs. Hi Brook! Yes, I’m glad I discovered it too. I’ve been trying it on so many things – all delicious. And if it’s got other special powers beyond just great flavors, all the better!